He may be the luckiest pig in the world. Instead of a one-way ticket to a slaughterhouse, this month-old piglet will live out its days in an animal sanctuary, CBC reports. Quebec police say the little guy tumbled out of a truck bound for a slaughterhouse near Brossard, Quebec earlier this week. 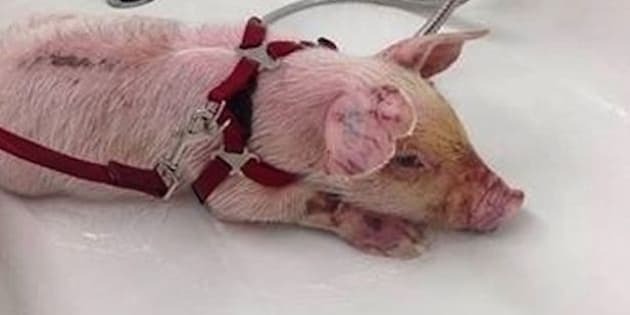 "The people who were following that trailer saw the piglet sneak through a hole and fall off the trailer," Sûreté du Québec spokeswoman Joyce Kemp said. Police then called animal control officers, who collected the young fugitive. Not long after going on the lam, an online network of animal lovers ushered the piglet to a new home — Wishing Well Sanctuary in Bradford, Ontario. He wasted little time in finding a name. And a bevy of admirers. "I even bought him a small sweater because it's cold and he's so young," sanctuary director Brenda Bronfman told Le Journal de Montreal. "It is always so heart warming when a community gets together to make a difference a one little soul," sanctuary staff wrote on their Facebook page. "Thank you so very much for everyone’s support, it truly is heart warming. Welcome home little man." The sanctuary added that Yoda has "a few scrapes from his fall, but fortunately is lively and eating well." Looks like Yoda's incredible journey has brought him to the greenest of acres. The Wishing Well keeps the animals that end up there, meaning this little piggy will never go to market. "He's just going to live the rest of his, god willing, long life," Bronfman told CBC News. "And will be happy with the other pigs and all the attention. There is always somebody on the farm, and he will just be loved for the rest of his natural life."